SEBRING, Fla. - The first convertible version of the Pratt & Miller Corvette C6RS supercar for the street will be on display at this weekend's Mobil 1 Twelve Hours of Sebring, the season-opening round of the 11-race American Le Mans Series. The bright yellow C6RS that will be featured in the Corvette Corral at Sebring International Raceway belongs to Jim Miller, co-founder of Pratt & Miller Engineering. Orders are now being taken for the limited-edition Corvette in both coupe and convertible body styles, with the first deliveries to customers slated for April. "Developing the Corvette C6RS supercar has been as rewarding as developing the championship-winning Corvette C6.R race car," said Gary Pratt, co-owner of Pratt & Miller Engineering. "We focused on performance, of course, but also on noise, ride quality, and passenger comfort - attributes that aren't considered in a purebred racing car." 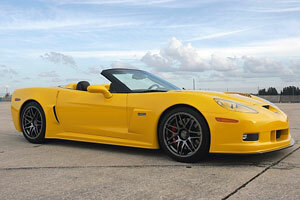 The Corvette C6RS can now be built on a Corvette Z06, Corvette coupe, or Corvette convertible platform. "Our prototype was based on the Z06's aluminum chassis, but in building the first convertible, we've now developed a suspension package for the hydroformed steel chassis used in Corvette coupes and convertibles," Pratt explained. "Ron Fellows tested the C6RS extensively at Michelin's test track," Pratt reported. "He was running lap times that were quicker than they'd ever seen. Anyone who drives the Corvette C6RS will be impressed with the level of performance and luxury it delivers."